I know my writing has changed in the past year. The two kinds of writing - the made-up scary stories and the documenting of events in Skeleton Creek - have slowly become one. I don't have to make up stories any longer, because I'm more certain than ever that the very town I live in is haunted. Ryan needs to write things down. He needs to get the truth down on paper. On paper, maybe the horrifying events at the dredge won't seem so scary. Except that they kind of do. See, Ryan and his best friend Sarah were exploring the abandoned dredge when something happened. Ryan fell and shattered his leg. He fell... or something pushed him. Sarah got some of it on video and between Ryan's recollections and Sarah's videos, the two of them start putting together the awful truth about Skeleton Creek. They'll uncover clues that lead to something more sinister than either of them could imagine. But can they get to the bottom of things before someone else gets hurt... or worse? Okay. It's quite possible I've become a scary stories wimp since I was a teen. This book creeped me out. In a way I would have loved when I was 12 or so. I have apparently gone soft in my old age, but I really think this is a book that many kids are going to love. The story's written in diary format. 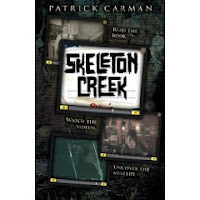 Ryan, cooped up in his parents house, explores the mysteries of Skeleton Creek in his journal, a true account hidden from his parents. The text is printed on lined paper and the font looks like handwriting. Emails to and from his friend Sarah appear to be taped into the pages of the book. As Ryan is writing his story down, Sarah is taking videos and emailing the links to Ryan. The reader can log on to www.sarahfincher.com and watch the videos (passwords appear every so often in the book). You can get a little preview of how it works (and read an excerpt) here. If you don't have immediate access to a computer the story works without the videos, but the videos add a lot to the creep factor. I started reading this on my break at work and then went back to my computer to catch up on the videos and that worked fine, too. I think it's a really interesting concept and I think kids are going to love the extra oomph that the videos give. The videos and the format of the book really help to build tension and atmosphere. They also serve to break up the text a bit and keep reader interest from flagging. I don't think that'll be a problem with this series. I found it pretty hard to put down. And yes, I said series. The last video ends on a fairly big cliffhanger and there's a sequel a-comin'. I agree with others' criticism of Ryan's journaling-as-he-goes format. It's believable in some places, but not so believable in others (although I appreciate the difficulty of creating really tense action scenes in this format). I also found the girl playing Sarah to be a little annoying. But those are minor criticisms in an otherwise engaging read. Read more reviews at 100 Scope Notes, A Year of Reading, and Maw Books Blog. You might want to wait until you've read the book to checkout skeletoncreekisreal.com (or you might want to go ahead and check it out... your call...). Skeleton Creek will be available February 10. Skeleton creek rocks! I thought R.L.Stine was the only good horror author, until I read this book. I just got a new video camera and who knows what I'm going to tape.